Publication: Thursday, November 15, 2018. DataHawk is a web-based Amazon Analytics Tool that combines a Keyword Ranking Tracker, a Product and Buy Box Tracker, a Market and Keyword Analysis tool, a Product Research engine, and a Sales Reporting tool. This is a blog post where we share some insights on the topic of joining the Amazon Brand Registry program. Our software comes with a free plan and advanced paid plans for sellers, vendors, and agencies of all sizes. There are millions and millions of products on Amazon. The competition is harsh as there are thousands of brands, each trying to get their own piece of the pie. If you have taken the path of private labeling and you are planning to sell branded products on Amazon, you have to find the best way to deal with the competition. You will have to use the Amazon Brand Registry program to do so. The Amazon Brand Registry service is designed to help brand owners selling through Amazon protect their intellectual property, get greater influence and control over their brand’s product listings on Amazon, and create an accurate and trusted experience for customers on Amazon. According to Amazon, more than 100,000 brands around the world were registered in the Amazon Brand Registry program as of November 2018. In this guide, we will help you learn how to successfully own your brand and sell product on the Amazon website. Let’s get started. Amazon Brand Registry will enable you to take many advantages of the platform and sell you branded products with ease. For brands that are not part of the Amazon Brand Registry program, product listings content ownership (images, title, description etc.) is shared across different sellers, and there is no guarantee your own content will be picked by Amazon and surfaced to customers searching for the product you’re selling. The reason for this is that, in order to make things easier for shoppers and to provide the ultimate shopping experience, Amazon uses the A9 algorithm which not only affects search results rankings, but also a product listing content and the seller who gets to win the Buy Box and collect the sale. This can be frustrating if your product content is great, but the algorithm picks a different and less relevant one that has been provided by another seller, making your product listing appear incomplete or inconsistent. This is where Amazon Brand Registry comes in very handy. This service will allow you to take complete control over your product listings. This course of action can be pursued by both manufacturers who want to directly sell on Amazon or people who decide to try private labeling. 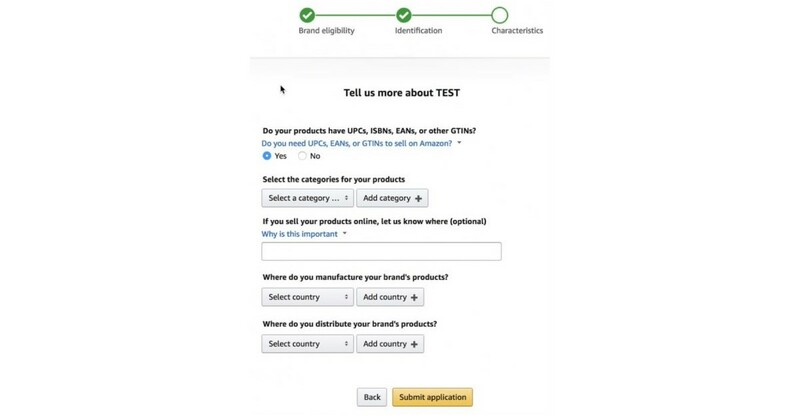 We advise you to check our Amazon FBA Private Label vs Retail Arbitrage article. In any case, from a simple web interface, you will be able to see all the products listed, verify the information, and keep it up to date. Did you know that more than 80% of Amazon sales go through the Buy Box? If you are not selling via the Amazon Brand Registry service, the Buy Box rotates among the sellers. There are many factors that are taken into the “who will have the Buy Box for a specific product” rotation. Some of these are fulfillment method, shipping time, landed price, order defect, valid tracking rates, and many others. Once you register via the Amazon Brand Registry service, you will be the sole owner of the Buy Box for the products you are listing. This means that all the profits will go to you and it significantly makes it easier to control counterfeit and hijacking. But we will come to this later on. In case there are many retailers selling your products on this platform, things can get really messy. They can list the products as they want, write their own descriptions and titles. If you are trying to build a brand, with a unique selling proposition, voice and values, this kind of inconsistency can ruin your efforts. This is why many manufacturers and people selling private label products on Amazon use Amazon Brand Registry. Thanks to this service, you, as a brand owner or sales manager, can use powerful features to control how brand representatives launch and manage their sales. With this service, you will be able to add more consistency to your branding strategy and make sure that your brand image remains exactly as you have planned it to be in the first place. Customers do not build relationships with product names nor their descriptions. Instead, they build a relationship with the brand. And the brand is exactly what they remember when they decide to look for things to buy online. The common mistake that new sellers tend to make on this platform is that they forget about this. But how can you count on delivering an easy to remember customer journey or build a trustworthy brand image if you don’t have a brand? With Amazon Brand Registry, launching a brand is really easy. With all the control, you will be able to create a trusted experience for your customers. This ensures repeat businesses and helps you stand out from the crowd on this immensely popular platform. Amazon has a very strict policy regarding counterfeiting. This is a large platform and if you don't protect your products, they can easily be counterfeited. This can ruin your business. Your budget can be drained, and your image as a seller can be seriously harmed. Don’t worry, there are several mechanisms in place to protect brand owners. During 2017, Amazon expanded the Brand Registry service to help people easily remove counterfeit goods from the platform. Once the counterfeit goods are flagged, Amazon will take down entire listings and ban seller accounts. All of this is controlled via the simple interface of the Amazon Brand Registry service. When you have sole ownership of the Buy Box for your brand, you can easily identify hijackers and contact Amazon to have them removed. If you have any questions regarding your enrollment in this program, you can contact the Amazon Brand Registry team via this contact form. While we are at it, we cannot go on without telling you that there are some downsides of using the Amazon Brand Registry service. In order to sell products on Amazon as a brand owner, you have to have a registered trademark. Registering a trademark is a somewhat complicated process and it differs from country to country. We will go through several trademark registration processes in this guide. So, be prepared to put some time into it. This will also require you to have a starting budget, as there are several costs associated with this process. If you have brands on the Amazon platform and you are selling products under their trademark, you will have to re-enroll all of them for the new Amazon Brand Registry to get access to all the features and protection options this service offers. This also requires some time and cash. As a seller on Amazon, your primary interest is profits. And that’s totally fine. This is why we have to bring up this last downside of using this service. Launching a brand for completely new products you want to sell on Amazon has its fixed costs attached to it. Since you don’t know how well they will resonate with the customers, investing in a brand becomes is a risky operation. This is why experts recommend having only one brand and using it to sell all products. Hopefully, by now, you have all the information to decide if you want to give Amazon Brand Registry a go. If you do, there is a somewhat long process ahead of you. Don’t worry, we have created a list of all the things that you need to become eligible for the Amazon Brand Registry program, along with things that can help you turn your brand into a success. Here they come. As you can see, there are several things all these requirement lists have in common, the trademark being one that is most important. This is why we have decided to give you instructions on how to register your brand with major world’s agencies in a separate section. For now, let's see what are the other items you have to cross off this list. In order to be able to register a trademark in any country, you will need a brand name. You will have to come up with a unique brand name, something that will resonate with the customers in your target market. If you already have a company, you can use the company name as the brand name. But if you are starting from scratch, you will have to come up with a name that distinguishes your products from the others on the market. The next item on your list is a logo. A logo is a simple graphic mark, or a symbol if you prefer. It will help your customers instantly recognize your products. Look at the brand name and logo as the main constituents of your branding strategy. Whenever you list your products, they will both pop up. The customers will associate your values, and the experience they have with you with these two. Fortunately, you can get your hands on a professionally designed logo very easily today, thanks to the many websites that organize logo competitions for firms and designers. The official website is something that you don't need to have. On the other hand, it will help you promote your brand and your products. When it comes to increasing brand awareness, your website has a huge role to play. With a little bit of SEO and a good content marketing strategy, you can inform more customers about your products and generate more leads that you can send to Amazon to complete sales. Social media marketing is hugely popular these days. It is also a great way to expand your reach, fortify your online presence, and make more customers interested in your brand. The main thing that differentiates this method from the others, is that it comes with an opportunity to directly interact with prospects, leads, and customers. This is why we have included it in our list. The location where you distribute your brand’s products. Starting March 2017, Amazon brands can only register an account on Amazon Brand Registry Program if they have a government registered trademark. 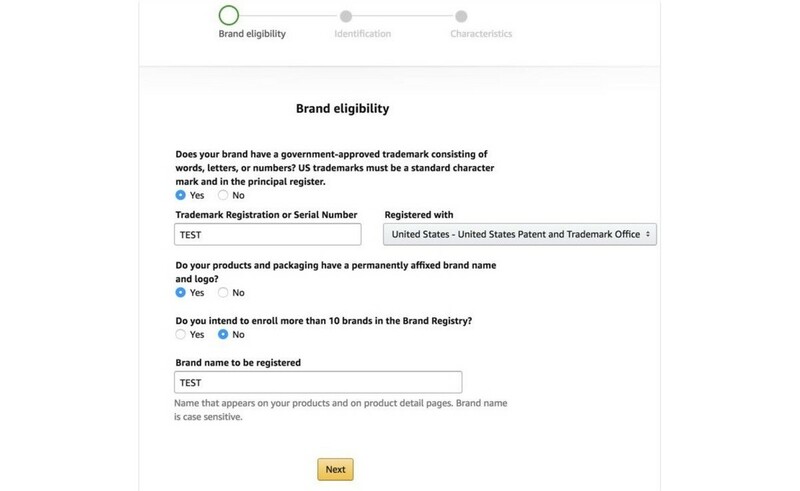 To be eligible to register and sell as a brand on the Amazon platform the trademark has to match the brand name printed on your packaging and products. Also, the trademark has to be a standard character mark. It is also important to know that not all issued active word marks are eligible for the Amazon Brand Registry Program. In order to qualify for it, your active word mark has to be issued by trademark offices and government patent in the US, India, Canada, Mexico, Japan, UK, Italy, Spain, Germany, France, and the European Union. If you are completely new to the trademark registration process, we recommend you hit the USPTO official website and familiarize yourself with the basics. You can complete the application process online even if you are not residing in the US. Due to the complexity of the process, many people advise getting a good trademark attorney. But if you devote some time to read all the instructions found on the official website, you will be able to file the application yourself without any troubles. The process is quite simple. First, you will have to select a mark. You should know that, while the USPTO registers the trademark, it is not responsible for enforcement, you are. In your case, you need a standard character mark format. Then you have to identify the goods to which the trademark will apply. You can search the database to see if the mark you want to register is not already claimed. If this is not the case, then you should identify your basis for filling the application. Once you are done, you can proceed to the next step. Now it is the time to get familiar with trademark fees. Keep in mind that the application fee will not be refunded if your application doesn’t result in registration. Once you have done all that, you can file the application online. Make sure to regularly check its status so you don't miss the filing deadline. This part of the process may take up to several months. If everything goes well, your mark will get approved for publication in the Official Gazette and your mark will be registered. Don’t forget to maintain your registration as it will get canceled if you fail to make required filings in time. If you want to run a business and sell on Amazon while using the Brand Registry program, you will need to get your trademark registered with EU IPO. To process resembles the one with USPTO in the US. To be honest, all of these processes look alike. The major difference is connected to fees. EU IPO offers a great Checklist to minimize the risk of your mark application being refused. In this case, your you will not receive any refunds. The registration process starts with trademark search availability. This will help you save both time and money. Once you have determined that your mark is available, you should proceed and file your application via the online form. The filing process is straightforward. The five-step form allows you to specify everything about your trademark. Make sure to use the built-in database to properly classify your goods. Before you start, you can assess how much money you will need by using the official EU IPO fee calculator. Before you file your trademark registration with INPI, you will have to select products. INPI allows you to select more than 10 items per class for the same fee. You also provide your brand name and the address. The INPI has a great availability search form. Make sure that the mark is available for registration before you file the application. At this point, you will fill the application form and pay the fees. It takes up to 6 weeks before you can see your mark application published in the official INPI bulletin. 3rd parties have 2 months to file oppositions and observations. If there are no 3rd parties objecting, you can proceed to the registration process. In the opposite scenario, you can file a divisional application and register your mark for products unaffected by the opposition. Once everything is settled, your trademark is going to be registered and protected for 10 years. Registering a mark with UK IPO is a straightforward process. UK IPO has fine-tuned their search engine to allow you search for trademarks by keyword, phrase, image, owner, and/or trademark number. Once you are done, you can fill the form and file the registration. UK IPO offers convenient online trademark forms that you can file from the comfort of your home. The pricing policy is quite transparent. You can review it here. After you are all set, you can click on the Apply Here button and start the registration process. Within 20 days following your application, you will receive feedback. If the examiner finds any problems, you have 2 months to resolve them. After 2 months, your application will be published in the official journal. Any 3rd parties will have another 2 months to make objections. Once the objections are resolved, you will get a certificate of mark registration. The mark lasts for 10 years. You can register a trademark with DPMA by filing an online form, electronic application, or a paper-based application. Before you start the process, it is advised to read the formal requirements paper, which is written in German. The DPMA register is an easy to use tool to check if your mark is available. Once you are done, you can file your application. The online filing form is the most efficient way to file your application. The DPMA will examine your application. If it is not violating any previously registered marks and it complies to all the requirements, it will be published in the official journal and you will receive a certificate of registration. To benefit from all the features this program has to offer, sign up for Amazon Brand Registry with the username and password you use to log in your Seller Central or Vendor Central accounts. Once you start the registration process, you will have to go through the 3 step form. Before you fill this form, make sure to consult your trademark certificate of registration. First, select the country your mark is registered with, and then enter the mark registration or serial number. Answering the rest of the questions is straightforward. Check “Yes” if your products and packaging include your brand name and logo (if they don’t, you won't be eligible for the program). Check “No” if you don’t intend to enroll more than 10 brands in the registry, enter your brand name and click “Next”. To complete the identification step, you have to provide product and packaging images. You can upload up to 10 product image files. Each file should be less than 1.5 Mb. Every image must contain your product with visible branding. The same rules apply to product packaging images. In this step, you will have to provide some additional information to Amazon to successfully complete your registration with Amazon Brand Registry. Each UPC code is unique for the specific ASIN of your listed products. If you have them, you can enter them here. Then you have to select the categories for the products that you are listing. If you have your official website where you sell your products, make sure to list them in this form. 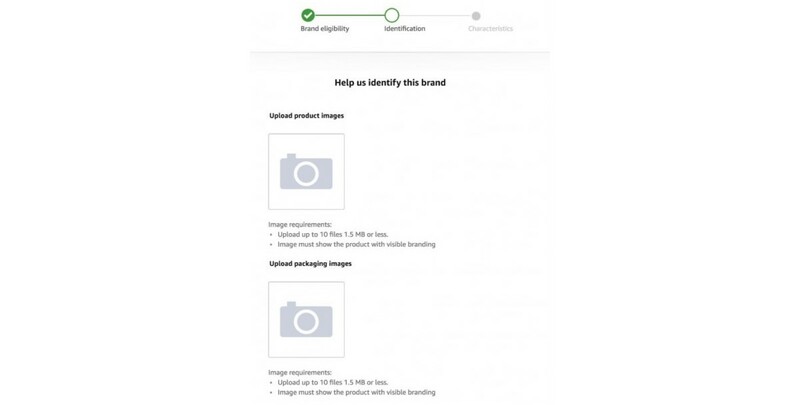 You want to make sure that your company name, logo, and products images found on your website match the ones that you enter in the Amazon Brand Registry form. The approval process usually takes no more than 2 weeks. If everything goes smoothly, you will be in the Amazon Brand Registry program. If by any chance you get rejected, carefully read the Amazon’s response and identify the Amazon’s reasons for refusing your application. Fix the problems and reapply. How to Register Several Brands? You will be happy to find out that Amazon has no restrictions when it comes to registering several brands under one seller account. The process is practically the same as the one we mentioned above. You will have to meet the requirements (trademark is a must-have), go through all the steps, wait for approval, and finally register. This is a great option for sellers to protect multiple brands and products under one account. All you have to do is log into your Brand Registry account and click on the Enroll a new brand located on the home page. How to Stop People from Infringing On Your Listings? Amazon is a very popular platform, don't be surprised if you see people list your products for sale and try to hijack your Buy Box. In order to spot these occurrences on time and avoid losing profits, you should use one the best Amazon Analytics tools on the market - DataHawk. Once you start your free trial account, you will be able to browse through the Amazon products database and perform quick searches. This is the most efficient way to discover such products and who is listing them. You can further use DataHawk to optimize your listings and identify the most promising keywords. You should check our Tracking Product Keyword Ranking on Amazon guide. But let’s get back to what to do once you discover peole listing your products for sale. Once you discover those sellers or anyone who tries to edit your listings (change images and bullet points), you should use Report Infringement tool by Amazon. This tool is very easy to use. All you have to do is find the listing that’s violating the Amazon Brand Registry policies and report. You can repeat this process every time you find a person or company infringing on your brand. Thanks to this new program by Amazon, you will be able to stop people from hijacking your products before they cause serious harm to your branding strategy. If you list products before your register with Amazon Brand Registry you will have to go back and activate this program on them. The first thing you want to do is compile the list of all the products you have on sale on Amazon. Then you need to log in your Brand Registry account and click on Reports > Business Reports > Brand Performance. This will show you the list of all the items enrolled in Brand Registry. Once you cross-reference these two lists, you will be able to identify the items that are not included in the Brand Registry program. To make updates, you have to use a flat file template. To create this file, you should access the Category Listing Report and download the category of products you are listed in. Delete everything except the activation method and product required data. Use the file to do a partial update. Amazon Brand Registry is a great program by Amazon. As you can see, it offers great benefits to people who want to use the platform to sell their products, build their brand, and offer the unique experience to the customers. Brand Registry will allow you to take full control of your product listings, maintain consistency, and prevent infringement and product hijacking. The only downside of using this program is that it requires time and money, especially when it comes to the trademark registration process.